BlueHost was built upon open-source technology, and first appeared in 2003. They provide cloud-based hosting, at shared VPS, and dedicated levels. Their shared hosting plans are affordable, and include several extra features that aren’t available for the same prices by many other competitors. BlueHost is owned by a parent company, Endurance International Group, which also owns the hosting service, HostMonster. The CEO has been managing hosting services since the late 90s, and has plenty of experience keeping these services running through two decades of major changes in the Internet landscape. Every business needs some kind of website these days, and a professional hosting service like BlueHost is an easy way to get something in place for a small business. Their interface is easy to use, and they have plenty of hosting options to choose from. The shared hosting tier is extremely affordable, and they use basic Weebly site-building software that most users can learn quickly. One of the few downsides is that there is no monthly payment option. You must pay by the year for the shared hosting plan. However, at less than the price for a single month of hosting on many other services, this drawback isn’t really a deal breaker. What may be is the fact that to build a website with all the most modern features, you’ll have to install add-ons during the website building process. The email service through BlueHost has an excellent spam filter, and the 30-day money back guarantee is helpful for those who want to try the service when they aren’t sure. While the customer service receives mixed reviews around the web, the unlimited hosting, file transfers, email accounts, and additional advertising services are often enough to make it worth resigning yourself to long waits with customer service. If there is one serious concern for new users of BlueHost, it is the unclear information on how and when they will be charged. The shared hosting plan includes a free domain for a year; after that, presumably the domain will be charged to your billing information with the annual hosting fee; but this information is not listed clearly anywhere during the sign-up process. Additionally, while you’ll get that first year for very low prices, the renewal costs can be as much as 90% more than your original price. This is typical for most hosting services, but it’s still something to watch for when you’ve reached your first year with BlueHost. BlueHost sites are generally considered very reliable. The company builds its own servers, and does automatic daily backups of all its sites in the event that an outage does affect the servers. There were two major outages in 2014, but no outages reported since then. BlueHost is probably the best option on the market if you need a basic host that fits a tight budget. BlueHost is one of the most well-known hosting services for a reason. They clearly understand what is necessary for small and medium-sized businesses to run an effective website, and they offer just enough extra features to stay relevant in the world of sleek and expensive web hosting services. 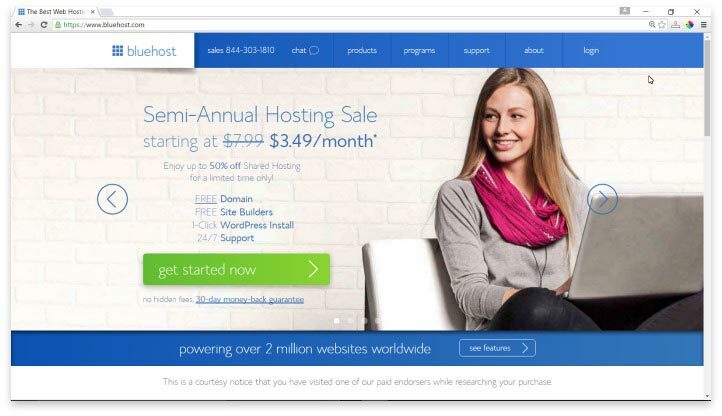 If you need a basic host that fits a tight budget, BlueHost is probably the best option on the market. All the extra features mean that you’ll create a much better website experience for your customers or site visitors, without breaking the bank or needing to spend a lot of time learning how to build a website. Have you had an experience with this company? Please share your Bluehost reviews below.